"In those days, Peter stood up in the midst of the disciples and said..." As the fiery spirit to whom the flock was entrusted by Christ and as the leader in the band of the apostles, Peter always took the initiative in speaking: "My brothers, we must choose from among our number." He left the decision to the whole body, at once augmenting the honor of those elected and avoiding any suspicion of partiality. Did not Peter then have the right to make the choice himself? Certainly he had the right, but he did not want to give the appearance of showing special favor to anyone. "And they nominated two," we read, "Joseph, who was called Barsabbas and surnamed Justus, and Matthias." He himself did not nominate them; all present did. But it was he who brought the issue forward, pointing out that it was not his own idea but had been suggested to him by a scriptural prophecy. And they all prayed together, saying: "You, Lord, know the hearts of men; make your choice known to us. You, not we." Appropriately they said that he knew the hearts of men, because the choice was to be made by him, not by others. Daughter of Giuseppe and Maddalena Mazzarello, the eldest of ten children born to a farm family in the mountains; seven of the children survived, and Maria learned the lessons typical of a big sister. Field worker. Member of the Pious Union of Mary Immaculate. Assisted at her parish, teaching catechism to younger children, helping the sick. She nearly died of typhus at age 23, and she never really recovered her strength or health again. She and her friend Petronilla began working as dressmakers. They discovered a joint interest in working with children, and started a school for girls that soon turned into a boarding school. Each Sunday they offered the local girls, whether students or not, the chance to come to the school for games and prayers. Maria cofounded the Daughters of Mary Auxiliatrix, which was under the spritual direction of Saint John Bosco. She was the first Salesian Sister, and served as superior of the order, founding houses in Italy and France. The eldest son of Pyrenean peasants, Arnold and Gratianne Garicoïts. His family sheltered priests escaping the persecutions of the French Revolution. As a boy Michael worked as a shepherd on neighboring farms. He early felt a call to the priesthood, but his family was too poor to afford his eduction; his grandmother arranged for the boy to work in the parish rectory and then in the kitchen of the bishop of Bayonne, France in exchange for his education. Michael studied philosophy at Aire, France, theology in the major seminary at Dax, France and was ordained in the diocese of Bayonne in December 1823. Parish priest in Cambo where he fought Jansenism by promoting frequent communion and devotion to the Sacred Heart. Professor of philosophy at the diocesan seminary at Lestelle-Bétharram, France. Rector of the seminary there. Helped Saint Jeanne Elizabeth des Bichier des Anges to found the Daughters of the Cross (Sisters of Saint Andrew the Apostle). Founded the missioner Priests of the Sacred Heart of Bétharram (Bétharram Fathers) in 1838. Blacksmith who gave up his work and worldly life to live as a hermit in Thebaid in Egypt. There his chastity was tempted by the devil in the form of a woman, but Ampelio heated an iron bar till it glowed, and used it to chase the demon away; from this choice he received the gift of being impervious to burns. 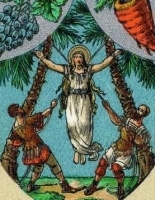 Immigrant to the island of Bordighera, Italy where he planted the first date palms (Bordighera is known as the “Queen of Palms” or “City of Palms”), lived in a cave, was known as a miracle worker, and set an example of prayerful Christian life. Son of Rodrigo Pelayo Valladaris, governor of Coimbra, Portugal and councillor to King Sancho I. Though his family encouraged him to entered the priesthood, and his royal connections provided him with several benefices and prebends, Gil had no interest. He studied medicine and necromancy; one of his biographers claimed Gil made a blood-sign pact with the devil for knowledge and skills, and that he renounced it only when a spectral knight appeared to him and ordered to change his life. Whether it was a real or metaphorical description, Gil did return to Christianity and studied theology in Paris, France. Joined the Dominicans at Palencia, Spain. Dominican provincial for Spain. Swineherd near Castlemaine, Ireland. Monk. Spiritual student of Saint Carthage the Elder. Priest. Hermit at Kiltallagh, Ireland in 580. He attracted would-be students, founded the monastery in Raithean in County Offaly, Ireland c.590, and served as its abbot. Abbot-Bishop of the Fercal district. He composed a rule for his monks. Wrote a metrical poem of 580 lines. Exiled from Raithean in 635 with 800 of his brother monks. With them he established a monastery which later became the famous school of Lismore. Wandering bishop who preached against heresies in southern Italy, arriving on the island of Capri c.739 where he settled to lead the church there. Teenaged wife of an Imperial Roman soldier stationed in Damascus, Syria. 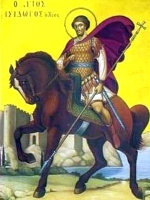 Cared for Saint Victor the Martyr when he was arrested for his faith. For this display of her own faith, she was arrested and martyred. Sailor. Brought Christianity to the Greek island of Chios. 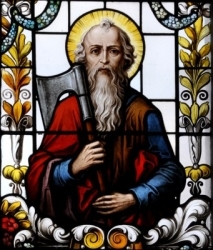 Martyred in the persecutions of Decius for refusing to sacrifice to idols. As a young man he felt a call to religious life, and joined the Mercedarians. He attracted so much attention as a miracle worker that for a while he lived a cloistered life at the El Puig monastery at Valencia, Spain. In north Africa he ransomed 108 Christians from Muslim slavery, but was imprisoned, chained and repeatedly flogged for refusing to renounce Christianity. Physically broken, he was released, returned to the El Puig convent, and spent his remaining years as a choir monk. Brother of Saint Felice of Aquileia. Martyred in the persecutions of Diocletian. 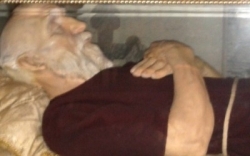 Brother of Saint Fortunatus of Vicenza. Martyred in the persecutions of Diocletian. Imperial Roman soldier stationed in Damascus, Syria. Arrested, tortured, blinded and martyred for his faith. While in prison, he was nursed by Saint Corona of Damascus. Benedictine monk at Fontenelle Abbey c.640. 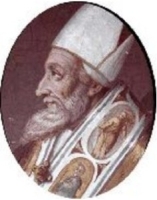 Bishop of Toulouse, France, c.656, and ruled for 12 years. In his later years he resigned and returned to Fontenelle to spend his remaining years as a monk. Steward to Saint Alexius. Travelled from Rome, Italy to Tarsus, Cilicia (in modern Turkey) to recover the bodies of martyrs there. Marytred there himself. Traditionally a member of the Theban Legion. Worked with Saint Costanzo to evangelize the region around the rivers Grana and Maira in northern Italy. Martyred in the persecutions of Valerian and Gallienus. Bishop of Vercelli, Italy c.530. Poet. Sixth century bishop of Ferentino, Tuscany, Italy during the reign of Roman Emperor Justin. Saint Gregory the Great wrote about him. Mid-6th-century bishop of Clermont-Ferrand, France. Uncle of Saint Gregory of Tours. Monk and then abbot of Saint Emmeram Abbey in Regensburg, Germany. Bishop of Regensburg. Second century missionary to the Britons, sent by Pope Saint Eleutherius at the request of King Saint Lucius. Marytr. Son of a poor labourer. Known for his piety, he retreated to live as a hermit near Passau, Germany. Martyr. A group of lay people martyred together in the apostolic vicariate of Korea.